One of the great pleasures I experience, as the current M.W.O.T.R.C. President, is when I receive an e-mail or telephone call from someone who knows about our Club and would like to make a donation of material focused on the Golden Age of Radio. Recently I spoke with Ric Nelson and also with Marcia and Ronny Bauman. Ric has an extensive personal and professional connection with radio and television. He worked for a number of television stations including WOR and CBS as a sound engineer. Ric was associated with many notable individuals including Bret Morrison, Edward R. Murrow, Ed Sullivan, The Beatles, and even Captain Kangaroo. Many of the priceless station recordings of Gunsmoke radio broadcasts were saved from destruction by him and presented later to John Hickman. Ric knew about our Club and our audio and print libraries and wanted us to share in his collection. 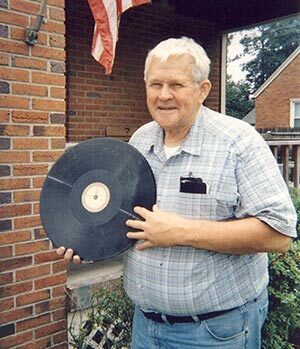 He has donated five 16" acetate discs which include a WTOP "News of Greater Washington" broadcast from 1949; a copy of "The Christmas That Almost Never Was" from 1950; and an episode of WBBM's Scattergood Baines from 1940. Ric has donated also some commercially produced LP albums such as "FDR Speaks"; "Edward R. Murrow: A Reporter Remembers-- Volume 1 The War Years"; and two The Bickersons records among others. He included more than 20 reel-to-reel tapes. Highlights are CBS Salute to WJSV Washington D.C. March 5, 1940; a Bell Telephone Encore program from 1969 featuring Fred Allen; as well as Heartbeat Theatre and General Mills Adventure Theatre episodes from the 1970s. There is also a large box filled with cassette recordings of Gunsmoke; The Lone Ranger; Amos 'n' Andy and many others. Ric Nelson holds one of the 16" transcription discs he donated to MWOTRC. Finally, Ric has given seven books including CBS: The First Fifty Years; Max Wyllie's edited collection of the Best Broadcasts of 1938 and 1939 scripts; and three volumes of Eric Barnow's History of Broadcasting in America. Our next donation came from the Baumans who attended and participated in our February 2009 meeting which featured presentation of members' own original radio plays. Marcia is a very talented actress, singer, and dancer. Her husband Ronny is an audio engineer who has conducted cutting-edge research into sound and how we we hear it. They were both so delighted with their experience at our Club that they want to return soon! They were pleased to donate a number of audio tapes featuring radio appearances of the Marx Brothers! I'm sure these cassettes will generate a lot of laughter and smiles from our members. On behalf of our Club, I would like to express our appreciation to Ric and to Marcia and Ronny for their generosity. If you have something you think the Club would enjoy adding to our libraries please let one of our members know!